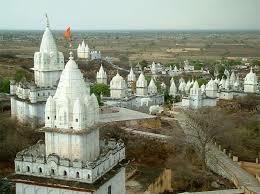 Here is some Information about Sonagiri Jain Temple in Sonagiri Madhya Pradesh India. Sonagiri Jain Temple is located at Sonagiri Hill Datia district of Madhya Pradesh.The temple was built by Digambar Jain and built in 9th and 10th century.The temple is dedicated to Jain 8th Tirthankar Bhagavan Chandraprabhu.Sonagiri Jain temples where Sonagiri literally means ‘golden peak’ are located at Sonagiri 60 kms near Bhopal in Madhya Pradesh.All 77 temples are located in the hills so do their views always mesmerize devotees coming to this place as pilgrims. It maintains an identity of being a sacred location in a state where large number of Jain devotees and ascetic Saints flock every day. 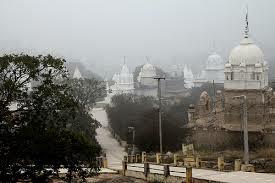 One can see as many as seventy seven beautiful Jain temples, all in the color white which are located around Sonagiri and twenty six to thirty one temples located in the village. The temple no. fifty seven is located on the hill and is considered to be the main temple. This temple has a very attractive artistic spire. The main deity in this temple is Lord Chandraprabhu, who was believed to be eleven feet in height. There are two other beautiful idols which belong to Lord Sheetal Nath & Parsvnath which have also been installed in this place. One can see a column of dignity, referred to as Manstambh which is 43 feet in height along with an attractive model of Samavsharan. The entire summit of this great majestic mount Shatrunjaya is crowned with about 900 temples, each rivaling the other for beauty and magnificence, presenting an awe-inspiring spectacle to devotees and visitors. The peak is a 3 ½ km climb of over 3500 steps from the town. 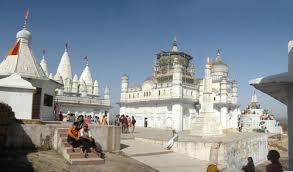 It consists of a cluster of over 800 temples which is divided into tuks. Throughout the cluster you can see detailed carvings, beautiful idols and images, jeweled statues and intricate toranas. Sunrise behind the temples is a great sight. One can enjoy views from the summit of the hills and the river Shetrunjaya. On a clear day, the Gulf of Cambay seacoast can be seen. Then there is the unique place known as Laghu Sammed Shikhar covering the area of 132 acres of two hills. 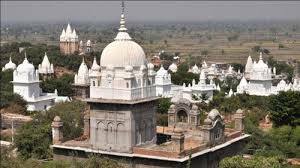 There are 77 beautiful Jain temples with sky high spires, Temple No. 57 is main among them. Acharya Shubh Chandra & Bhartrihari lived and worked here for spiritual achievements. They completed here some texts also. There is too much historic value of Sonagiri due to presence of several ancient Jain temples here. Shri Digambar Jain Siddha Kshetra is major temple alongside other temples that make this place famous Jain pilgrimage center. It maintains a religious value from 9th and 10th centuries due to presence of several such temples. It gained popularity as a sacred place to welcome large number of devotees and ascetic saints to practice self-discipline and so do they worship Gods as per Jain tradition. The foremost temple has an idol of Chandraprabhu in meditation, 11 feet in height. 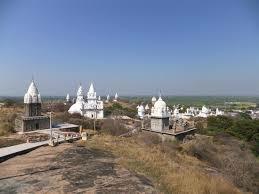 There are 77 striking Jain Temples in the hills and 26 temples in villages. Temple no. 57 on the hill is actually the main temple. It consists of a captivating spire. Two other idols of Lord Sheetalnath and Parsvanath are installed beside the chieftain. There is a column of dignity (Maanstambh), 43 feet in height, also a model of Samavsharan. The samavsharan of Lord Chandraprabhu came here 17 times. Nang, Anang, Chintagati, Poorchand, Ashoksen, Shridatta and many such saints achieved salvation from here. 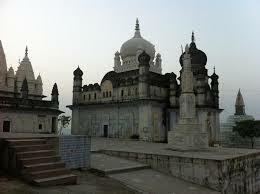 This is a remarkable place known as Laghu Sammed Shikar covering the area of 132 acres, spanning two hills. A pillar of white stone outside the temple is bound to catch one's eye, with its intrinsic carvings; there are 'chatris' (cenotaphs) on three sides of the pillar showcasing images of all Jain Tirthankaras. Temple no.60- Pisan Hari ka Mandir was built by a poor woman grinding grains with a millstone. Temple no.59 or the 'Gumbajdwar' has minars on all sides. The annual festival is held from Falgun Shukla 14th to Chaitra Krishna 5th. At Delhiwali Dharmshala there are 20 normal rooms, 25 semi-deluxe rooms and 25 deluxe rooms. Mess facility and other required items like utensils, bed, tent etc. are available.At Beespanthi Kothi there are 20 normal rooms, 15 semi-deluxe rooms and 15 deluxe rooms. Other required items like utensils, bed, tent etc. are available.At Tyagi Vrati Ashram there are 10 normal rooms and 4 deluxe rooms.At Terapanthi Kothi there are 30 normal rooms, 40 semi-deluxe rooms and 15 deluxe rooms. Mess facility and other required items like utensils, bed, tent etc. available.At Kund-Kund Nagar there are 45 normal rooms and 45 deluxe rooms, Mess facility and other required items like utensils, bed, tent etc. are available.Besides these there are three Jain mess halls which cater to the pilgrims. By Road : There are many public and private vehecals available to reach Sonagiri Jain Temple.The Datia is 15 kms,Jhansi 45 kms and ,Gwalior 60 kms fro, Sonagiri. By Rail : The Nearest Railway station is Sonagiri station.There are many railway station connected Sonagiri station. By Air : The nearest Airport is Gwalor station 36 Kms.